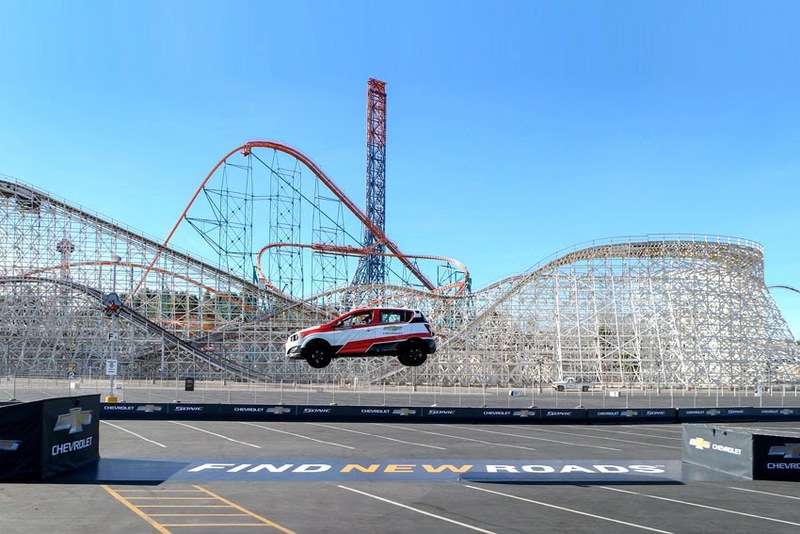 Driving a Chevrolet Sonic, television star and former professional skateboarder, Rob Dyrdek successfully set a Guinness World Record for the Farthest Reverse Ramp Jump by a Car with a total of 89 ft 3¼ inches. a Sonic to set an automotive first. In 2011, Dyrdek successfully performed a 360-degree kick-flip off a ramp in a Sonic. "The Sonic is a great car for firsts," said Dyrdek. "I have always been a Chevy guy, so when we decided we wanted to set a Guinness World Record for the finale of 'Fantasy Factory', using the Sonic again just made sense." Dyrdek performed the stunt before spectators at Six Flags Magic Mountain, while MTV filmed the jump for the season finale of 'Fantasy Factory'. To qualify for a Guinness World Records achievement, Dyrdek had to successfully land the Sonic on the catch ramp and be able to drive away from the stunt. With all high-speed action stunts, safety is a priority. The Sonic offers 10 standard air bags and high-strength steel as part of its body structure, making the small car a strong choice for this challenge. "We take extra care and precautions with each and every stunt we create," said Elia Popov, Owner, J.E.M. F/X Inc. "Rob is always willing to try anything once, and for this backwards jump we felt confident that the Sonic would keep him safe."